Mnangagwa, Chamisa both expresses optimism as Zimbabweans await election result – Royal Times of Nigeria. 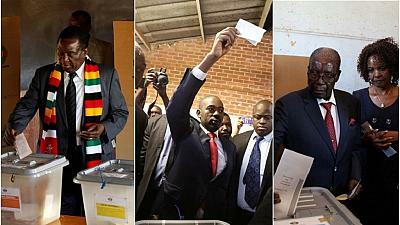 Zimbabwe is awaiting the results of its landmark elections, with both frontrunners saying they are confident. President Emmerson Mnangagwa said he had received extremely positive information but opposition leader Nelson Chamisa said his party is winning resoundingly. Zimbabwe is electing a new president, parliament and local councils. Monday’s vote – the first since long-serving ruler Robert Mugabe was ousted – attracted a high turnout of seventy-five per cent. European Union and US election monitors have been allowed into the country for the first time in sixteen years to assess whether the elections are free and fair. Zimbabwe Electoral Commission (Zec) chairwoman Priscilla Chigumba said she was satisfied there was no cheating.